Deadbolt Festival is making a return to its hometown of Manchester this autumn. The Saturday night will include multiple after-parties including Deadbolt’s own club night. The club night incorporates elements of interactive games, live music performances and giveaways throughout the night to create a house party atmosphere with "a hint of mayhem." 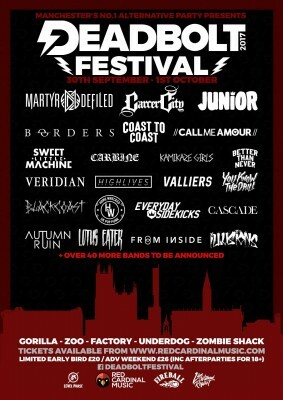 Amongst the first bands announced are Martyr Defiled, Carcer City. Junior, Borders, Coast to Coast, Carbine, Kamikaze Girls, Better Than Never, Veridian, Highlives, Valliers, You Know The Drill, Black Coast, Home Wrecked, Everyday Sidekicks, Cascade, Autumn Ruin, Lotus Eater, From Inside and Illusions will also be performing. Weekend tickets for the festival are available to purchase now at www.redcardinalmusic.com for £26 and will include entry to the afterparties for over 18s. Limited Early Bird tickets are available for £20.